All our switchplates are decoupaged by hand from original collages by Kate Hartley. Layers of acrylic medium and varnish are applied to a laser copy of the original collage that has been decoupaged to an industry standard light switch (that means it will fit on ANY light switch). Decoupage is a creative and durable process. The layers of varnish add a rich finish to the completed switchplate. In addition, decoupage makes the switch plates durable and sturdy enough for every day use. Our entire design concept is based on creating style and delight in the items we use everyday! Just wipe clean with a damp sponge. The single switchplates and outlets measure 3.5" X 5.5", the double switchplates are 5.25" X 5.25", the triple switchplates are 4.75' X 6.75". All of our switchplates are finished with gold spray on the back. 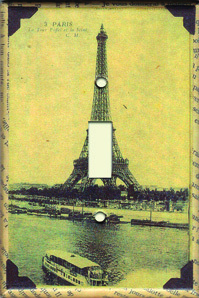 The switchplates are packaged with a black and white copy of one of my favorite french "carte postales"in a celophane envelope and come with beige screws for mounting.